Our editor recalls his father's Herreshoff Amphi-craft, a 13' sailing, rowing, and motoring dinghy designed by Captain Nat's eldest son, Sidney, and built during the Great Depression. 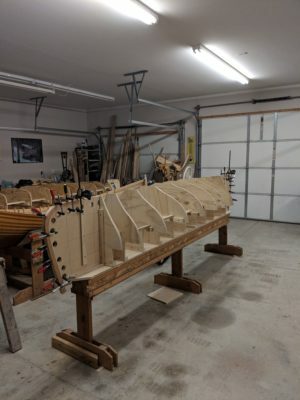 The Herreshoff shop built only 17 of them and two of them were delivered to Everett, Washington. One of those two made a lasting impression on three young children. James Wharram is well known for his catamarans. 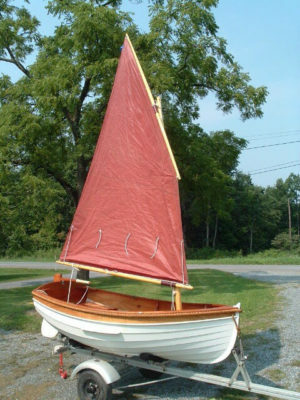 His Tiki 21, designed in 1981, it took advantage of stitch-and-glue construction and has proved itself in ocean crossings and has remained a popular trailerable gunkholer. 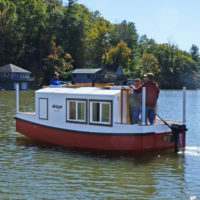 WINONA, a pulling boat built for a mountain lake in New York State's Adirondack Mountains, inspired Tom Regan, a boatbuilder living on the tidelands of Washington State, to create a version of his own. We take a look at the Ebb from Grapeview Point Boat Works. 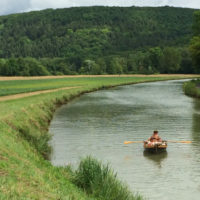 Polly and Mat Hilton left their home in Devon, England, rowing and sailing a lapstrake skiff that Mat had built. Fifty-six days and 870 miles later they had crossed France by river and canal and reached the Mediterranean Sea. 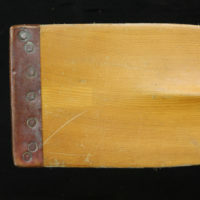 Oar blades, ideally, should only come in contact with water, but they often do battle with rocks, sand, and barnacles in our comings and goings to and from landings. 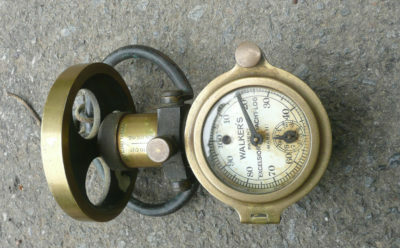 Copper tips will take the abuse and not show their age as easily as paint and varnish will. Curt White made a number of modifications to his Escargot to turn it into a roomy, well-furnished, and warm living room afloat. BEULAH takes Curt and his wife in style and comfort to the lakes near their home in the hills of western North Carolina. It's easier to extend your small-boat cruising into the shoulder seasons when you have a way to stay warm when the weather turns chilly. The Portable Buddy from Mr. Heater uses standard 1-lb propane canisters to create radiant infrared heat to warm small cabins and tents. Pettit offers a multi-purpose epoxy that makes flexible bonds as well as fills that won't sag or shrink. Dispensed from a cartridge that fits common caulking guns, it is easy to dispense for jobs small and large.